Frustrated by the bilateral and multilateral arms control stalemate and energized by concerns about the risk of nuclear weapons use, more than 120 non-nuclear-weapon states have just adopted a nuclear weapons prohibition treaty that will be opened for signature in September. Absent adherence by the world’s nuclear-weapon states, which is a given, this treaty will not break the global nuclear arms control stalemate nor reduce the risk of the first use of a nuclear weapon since 1945. This troubling reality calls for fresh consideration of what may yet be achievable by both nuclear-weapon and non-nuclear-weapon states, lest nuclear dangers grow. Today’s differences are so great that dramatic advances cannot be expected. Rather, more limited opportunities should be pursued to overcome the bilateral U.S-Russian and U.S-Chinese arms control stalemates, go beyond the deadlock at the UN Conference on Disarmament, and reduce the polarization between non-nuclear and nuclear-weapon states that threatens the future of the nuclear Nonproliferation Treaty (NPT). Action is needed now because the turning points ahead, unless avoided, will increase global nuclear dangers significantly. The United States and the other NPT nuclear-weapon states have a special responsibility, given their own interests, NPT obligations, and possession of nuclear weapons, to prevent those turning points. The United States and Russia continue to implement the New Strategic Arms Reduction Treaty (New START). But its fate is uncertain after 2021, when it can be extended for up to five years, replaced, or allowed to expire. The Trump administration has announced a major review of nuclear policy, evaluating questions such as the future requirements for U.S. nuclear forces and whether to reaffirm support in principle for the goal of abolishing nuclear weapons. 2 Further, Russia’s violation of the Intermediate-Range Nuclear Forces (INF) Treaty could augur its readiness to cast aside the decadeslong process of negotiated agreements to regulate its strategic relationship with the United States. There is deep skepticism about arms control in Moscow and among the more conservative U.S. defense experts who are likely to serve as senior Trump administration officials. There are many reasons for this. In Moscow, one important reason is that arms control no longer is seen as an effective means to restrain U.S. freedom of action, particularly regarding missile defenses and conventional-strike capabilities perceived as threatening Russia’s nuclear deterrent. 3 Ironically, U.S. conservatives believe that arms control imposes too many constraints on U.S. freedom of action, a view deeply rooted in former Cold War constraints on missile defenses. Still, neither country will benefit if the 50-plus-year legacy of negotiated regulation of their strategic relationship gives way to unfettered and nontransparent unilateralism on strategic decisions and deployments. The outcome would be fewer windows into each other’s strategic thinking, a renewed arms race, further worsening of political relations, and heightened risk of miscalculation in a crisis or confrontation. The challenge for Washington and Moscow is to step back and rethink completely the potential contributions of arms control in serving their strategic interests. A return to a dialogue of first principles is needed. That does not necessarily preclude a negotiated extension of New START for up to five years, for which that treaty provides. If the United States and Russia can quickly agree on an extension, it would buy time. An extension in itself, however, will not resolve their underlying skepticism about bilateral arms control. Specifically, Washington and Moscow should begin by taking stock of each country’s strategic interests, concerns, and concepts, including their divergent views of what is required for strategic stability between them. Both also should focus explicitly on the implications of alternative futures for their strategic relationship after the 2021 New START deadline, from more to less cooperation, from more to less strategic dialogue and engagement among military and defense officials, and from continuation of efforts to regulate cooperatively their strategic decisions and deployments to a breakdown of the arms control process in a new unilateralism. Both countries’ enduring interest in a legitimate and effective NPT regime must be factored into their thinking. Put starkly, if the decadeslong process of cooperative regulation of their strategic postures ends with New START, do they care, why, and how much? Assuming Washington and Moscow agree that the opportunity costs of increasingly more unilateral and more competitive strategic futures are too high, measured most in terms of growing strategic instability and nuclear risk but also great damage to their shared interest in a robust NPT regime, this return to first principles should next explore how to address each side’s strategic concerns. All issues should be discussed: offenses and defenses; space and cyberspace; conventional and nonconventional; deployed and nondeployed nuclear capabilities; other dimensions of nuclear risk reduction; compliance, including the INF Treaty; and perspectives on the usability of nuclear weapons. At best, this discussion of first principles would take place officially, led by senior officials in the White House and the Kremlin. Alternatively, Presidents Donald Trump and Vladimir Putin could create a special joint commission of retired senior political and military officials from their defense and foreign policy communities with governmental observers. In either case, the mandate would be to report on what is at stake should the bilateral arms control process collapse and, more importantly, possible cooperative ways forward after New START. The semiofficial option would be more exploratory and thus likely more attractive to the Trump administration and Putin’s Moscow. The prospects for such an exchange will depend partly on whether the two presidents conclude, for reasons set out already, that their countries’ interests would not be served by allowing bilateral arms control to fade into history. Those prospects would depend as well on whether announcing agreement to such exchanges would be regarded by Trump and Putin as signaling their commitment to seek an improved political relationship consistent with their statements following Trump’s election. Given deep uncertainties and suspicions about each other’s intentions, plans, and programs, the United States and China are nearing a lose-lose turning point of sustained strategic competition. 4 The prospect is growing that Washington and Beijing increasingly will take unilateral actions to lessen their uncertainties and suspicions. The result will be a costly arms race, greater risk of miscalculation if a crisis or confrontation cannot be avoided, and worsening political relations. If not prevented, a North Korean nuclear and missile threat to the United States will further increase the likelihood of strategic competition by triggering many U.S. defensive activities, whose spillovers would impact the U.S.-Chinese strategic relationship. The recent U.S. deployment of the Terminal High Altitude Area Defense system in South Korea, which China fears could undermine its nuclear deterrent, exemplifies that prospect. Chinese reluctance is perhaps explained by uncertainty about what such a process of reassurance and restraint would require of China and what it would get in return. Trump administration views remain to be determined, although with its emphasis on setting the U.S. nuclear arsenal as “top of the pack,” it could prove even more skeptical than the Obama administration of China’s strategic intentions, plans, and programs. Given both countries’ interests in avoiding a lose-lose situation that heightens strategic competition, official exploration of a more comprehensive process of mutual reassurance and restraint still would be the best approach. Yet, it could remain out of reach. Instead, Washington and Beijing should consider two more limited ways to test that broader concept. The newly initiated reviews of the U.S. nuclear posture and ballistic missile defense likely will take many months. China’s strategic posture is unlikely to be a central focus of these reviews, but it is unlikely to be an afterthought. As those reviews advance, the Trump administration should propose that the United States and China hold an official-level experts exchange to allow for Chinese input. That discussion could cover the overall regional and global nuclear landscape; the projected evolution of each country’s nuclear and other strategic capabilities, doctrine, planning, and investments in the region; and, more broadly and not least, the strategic choices by either country that would be of most concern to the other. Of course, there would be limits on what either country would say, but the results still would prove valuable to both sides. For Washington, an understanding of China’s evolving posture would be improved, and uncertainties would be reduced. Any later decisions that run counter to Chinese objections would be made at least with some insight into those positions. For Beijing, the payoff would be influence over Washington’s decisions, if only by making China’s concerns known in advance and signaling potential counters. For each country, this dialogue would be a valuable political signal to the other of its desire for a more cooperative, less competitive overall relationship. It also would be one way to begin to explore the concept of mutual reassurance and restraint. Turning to the second proposal, North Korea’s growing nuclear and missile capabilities will create significant pressures for U.S. and allied military countermoves, such as augmented regional and homeland missile defenses, conventional prompt global-strike options, augmented in-theater surveillance and regional-strike capabilities, heightened anti-submarine warfare activities, and cyberwarfare options. Against that backdrop, the Trump administration should propose a dialogue with Beijing focused on possible actions that the United States could believe necessary to neutralize North Korea’s nuclear missile threat and on possible Chinese reactions and responses to the spillovers for China of those actions. From a U.S. perspective, one purpose again would be to ensure that U.S. decisions were informed by an understanding of potential implications for the U.S.-Chinese strategic relationship. There also would be insights into Chinese strategic thinking, posture, and decision-making to the extent that Chinese arguments were buttressed by setting out the strategic logic behind specific concerns. An additional benefit for the Trump administration would be to highlight the opportunity costs for China of North Korea’s advancing nuclear and missile capabilities. For China, there again would be an opportunity to influence U.S. decisions. For both countries, such exchanges would enable their officials to identify and explore mutually acceptable options to manage the spillovers of U.S. actions for their strategic relationship in return for windows into Chinese activities and for Chinese restraint in areas of U.S. concern. 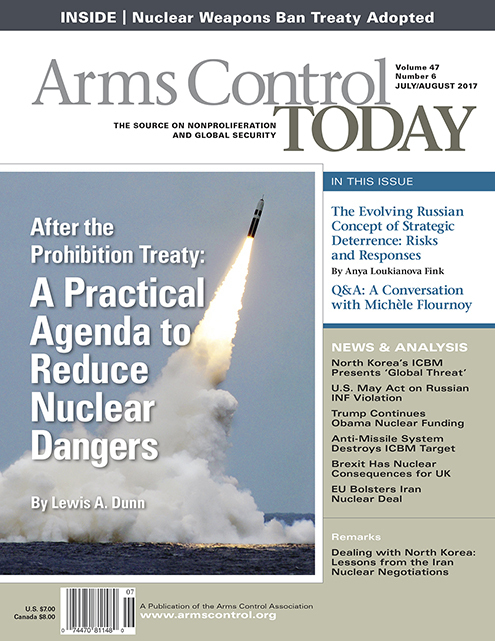 Multilaterally, a deadlocked Conference on Disarmament (CD) has been unable for over two decades to begin negotiations on a fissile material cutoff treaty (FMCT). An FMCT designed only to halt production of such material for nuclear weapons, however, is a treaty whose time has passed. Even if the CD deadlock ends, the payoffs of a production cutoff alone will be minimal. India and Pakistan will not adhere to such a prohibition, choosing instead to protect their options to produce more nuclear weapons materials; the five NPT nuclear-weapon states most probably have ceased production; and most non-nuclear-weapon states reject a production cutoff as an important Article VI step. Henceforth, a treaty placing limits on fissile material should be crafted explicitly as a nuclear disarmament building block. Specifically, any future treaty should encompass wide-ranging transparency measures, including declarations of nuclear weapons material production, utilization, and storage facilities; flows of fissile material for permitted military purposes; flows and sites related to the disposition and storage of nuclear weapons material from dismantled nuclear warheads; flows of surplus material placed under international safeguards; and best estimates of past production and existing stocks of nuclear weapons materials. At this stage, such transparency measures still would stop short of provisions for the required elimination of previously produced nuclear weapons materials. In addition, with the CD deadlocked, fissile material limits should be pursued elsewhere. The negotiation of the 1997 Mine Ban Treaty, known as the Ottawa Convention, and the current negotiations for a nuclear weapons prohibition treaty provide alternative models: in one case, an ad hoc negotiation among like-minded countries; in the other, a negotiation empowered by a UN resolution. This approach would be one way for U.S. officials to highlight the absence of necessary conditions for nuclear abolition, in this case, knowledge about past production and existing stocks of nuclear weapons materials. In turn, for U.S. NPT interests, it would signal readiness to cooperate with other countries to put in place such building blocks for sustained Article VI progress. Among other NPT nuclear-weapon states, China most certainly would be uncomfortable, given its traditional uneasiness about transparency, but it also could prove reluctant to stand aside from negotiations outside of the CD. Using an FMCT to provide vital ground truth on nuclear-weapon-state activities would offer critics among non-nuclear-weapon states a treaty that clearly would advance nuclear disarmament goals. Four years after the first of three conferences on the humanitarian impact of use of nuclear weapons, the five NPT nuclear-weapon states still lack a credible response to the humanitarian impact movement and the legitimate concerns it raises about the risk of use of nuclear weapons. This failure has been costly to their own interests and remains so. Along with frustration at today’s nuclear arms control stalemate, the belief of many non-nuclear-weapon states that the risk of nuclear weapons use is significant and increasing has been the most important source of support for negotiating a prohibition treaty. 7 In turn, that belief and the nuclear-weapon states’ response has heightened polarization within the NPT community. The continued intensification of this polarization is the most likely pathway to the NPT’s loss of credibility and legitimacy. That outcome is not in the interests of the NPT nuclear-weapon states or, for that matter, the non-nuclear-weapon states. In turn, although the magnitude of nuclear risk can be debated, it is increasingly possible to craft credible scenarios for a next use of nuclear weapons. For both reasons, the interests of the United States and the other NPT nuclear-weapon states would be served by acknowledging the concerns of virtually all nations about the risk of use of nuclear weapons and demonstrating their commitment to reduce that risk to an absolute minimum. With that goal, the NPT nuclear-weapon states should announce that nuclear risk reduction will become part of their ongoing exchanges as the five permanent members of the UN Security Council. Those exchanges could be carried out in the so-called P5 Process of annual meetings and interim discussions linked to the NPT or on the margins of the Security Council itself. An initial focus could be potential pathways to a next use of a nuclear weapon, whether by a nonstate actor or a state; by accident, intention, or miscalculation; limited or more extensive. Possible areas then could be explored for cooperation among the NPT nuclear-weapon states to prevent a next use. Cooperation could focus, for example, on how to defuse an escalating crisis between India and Pakistan under the nuclear shadow, perhaps the most plausible immediate pathway. Another focus could be cooperation to head off a terrorist nuclear attack. Actions by the NPT nuclear-weapon states to provide humanitarian assistance should a nuclear detonation occur is another area for cooperative response. Going beyond these elements, the NPT nuclear-weapon states could seek agreement on a so-called code of nuclear conduct comprised of basic principles to govern their activities and derivative undertakings to implement those principles. Specific areas for discussion include best practices for nuclear decision-making, nuclear safety and security, command and control, nuclear warning and alert status, nuclear risk reduction, nuclear doctrine and the roles of nuclear weapons, and affirmation of overall obligations, including their NPT obligations and the norm of no testing of nuclear weapons. As part of such discussions, the NPT nuclear-weapon states also could reach out to the two declared non-NPT nuclear-weapon states, India and Pakistan, and engage them on nuclear risk reduction. This proposal probably will encounter some if not considerable caution among NPT nuclear-weapon states. Nonetheless, aside from payoffs for their NPT interests, there is another compelling reason why they should embrace nuclear risk reduction. Any use of a nuclear weapon will directly and indirectly affect all of them, whether as targets, bystanders, responders, governments with citizens at risk overseas, holders of nuclear weapons, supporters of nonproliferation, and through resulting environmental effects. With the conclusion and opening for signature of the new Treaty on the Prohibi­tion of Nuclear Weapons, its many non-nuclear-weapon-state supporters will begin rallying adherents to ensure the treaty’s entry into force. Even so, their own nuclear disarmament objectives also would be advanced by efforts to reduce today’s greatest-ever polarization and rebuild habits of cooperation within the NPT. The nuclear disarmament ripple effects anticipated by ban supporters from their agreement to a prohibition norm remain uncertain and are longer term. It took nearly 70 years from the Geneva Protocol prohibiting the use of chemical weapons to the Chemical Weapons Convention eliminating those weapons. More immediate progress toward nuclear disarmament and nuclear risk reduction still requires cooperation from the NPT nuclear-weapon states. In that regard, Article VI remains the best legal hook for pulling those states along and, in the case of Trump administration officials, helping to convince them not to walk away completely from the historic U.S. commitment to nuclear abolition as the ultimate Article VI goal. Equally so, the NPT nuclear-weapon states have compelling interests in reducing polarization and rebuilding habits of cooperation within the treaty. It remains the most important legal foundation of global nonproliferation success, including its obligation not to acquire nuclear weapons and of safeguards and export controls. A strong treaty signals that the world’s nations believe that ever growing proliferation is avoidable. As seen in dealing with Iran’s nuclear weapons activities, the treaty’s obligations are critical for rallying international political support to constrain or reverse problem-country programs. Unless reversed, however, today’s polarization, frustration, and questioning of the NPT’s value could worsen, resulting sooner than anticipated in the erosion of the treaty’s credibility, legitimacy, and effectiveness. That outcome would be yet another damaging turning point. This risk and its consequences for U.S. nonproliferation interests should not be underestimated, particularly as the Trump administration proceeds with its reviews of U.S. policy on the NPT and the goal of nuclear abolition. The 2020 NPT Review Conference cycle, just now getting underway, is an opportunity to begin rebuilding habits of cooperation. “Special time” should be set aside at the second and third preparatory committee meetings, as well as at the review conference, for detailed exchanges on the issues of most concern across the NPT. These issues include the conditions and building blocks of sustained nuclear disarmament progress, including robust nonproliferation, as well as priorities for cooperative actions to put those building blocks in place; how to define the “effective measures” of nuclear disarmament required by Article VI and the phasing of those measures over time; nuclear risk reduction priorities and cooperation; and compliance and verification strengthening, including building on the public-private effort known as the International Partnership for Nuclear Disarmament Verification and the future UN Group of Governmental Experts on Verification. The goal of these exchanges would be to restore a sense of common purpose; create a shared vision of an achievable nuclear disarmament future in 2045, the 100th anniversary of the U.S. use of nuclear weapons against Japan; and energize actions toward that vision. The parties also could set a limited number of agreed priorities across the NPT to be achieved in the period between the 2020 and the 2025 review conferences. The decision of the NPT’s parties at the 1995 review and extension conference to set a deadline of the end of 1996 for negotiating a Comprehensive Test Ban Treaty is a precedent. That deadline was met and established what has become a global norm against nuclear testing, although the CTBT’s entry into force regrettably remains part of unfinished NPT business. Moving beyond today’s unstable global nuclear arms control status quo and successfully avoiding the most dangerous turning points will require actions by the five NPT nuclear-weapon states most of all. Other countries matter, whether that is the supporters of a nuclear weapons prohibition treaty in rebuilding cooperation or the non-NPT nuclear-weapon states in helping reduce nuclear risks. Yet, as the NPT nuclear-weapon states have emphasized in opposing a prohibition treaty, they possess the bulk of nuclear weapons. The security interests of the NPT nuclear-weapon states, including the United States led by Trump, would be advanced by taking on that responsibility to move beyond the status quo. Whether they will do so, even if only by pursuing the types of limited opportunities proposed in this article, remains to be decided. In that regard, historians have written that “modern history” or, in one case, simply “Germany” reached its turning point during the revolutions of 1848 and “failed to turn,” with catastrophic results in the 20th century. 8 The security and well-being of all countries requires that no historian should be able to write from a vantage point of 2045, 100 years after the nuclear detonations over Hiroshima and Nagasaki, that the NPT nuclear-weapon states had reached their turning points at the close of the second decade of the 21st century and then failed to turn, with costly results for them and other countries during the years that followed. 1. Lewis A. Dunn, “Redefining the U.S. Agenda for Nuclear Disarmament: Analysis and Reflections,” Livermore Papers on Global Security, No. 1 (October 2016), https://cgsr.llnl.gov/content/assets/docs/CGSR_Document_LLNL-TR-701463_103116.pdf. 2. John Landay, “Trump Administration to Review Goal of World Without Nuclear Weapons: Aide,” Reuters, March 21, 2017. 3. For a broader appraisal, see Alexey Arbatov, “Understanding the U.S.-Russia Nuclear Schism,” Survival, Vol. 59, No. 2 (April-May 2017): 33-66. 4. The following discussion draws on the author’s participation in “Track 1½” U.S.-Chinese strategic nuclear dialogue meetings. 5. See Bradley Roberts, “Strategic Stability: From 2009 to 2017” (working paper, 2017). 6. David C. Gompert and Phillip C. Saunders, The Paradox of Power: Sino-American Strategic Restraint in an Age of Vulnerability (Washington, D.C.: National Defense University Press, 2011); Dunn, “Redefining the U.S. Agenda for Nuclear Disarmament,” pp. 68-71. 7. See Alexander Marschik, statement at the UN conference to negotiate a nuclear weapons prohibition treaty, July/August 27, 2017 (Austrian ambassador). 8. The former is a reference to G.M. Trevelyan, the latter to A.J.P. Taylor. Lewis A. Dunn was the U.S. ambassador to the 1985 review conference for the nuclear Nonproliferation Treaty. The probability and consequences of nuclear weapon detonation events are far from trivial and underline the need for concerted action to resume disarmament with a view to achieving a nuclear weapons-free world. Here is a list of key facts and trends drawn from the contributions to our report, “Understanding Nuclear Weapon Risks,” for policymakers as they discuss next possible steps to take in nuclear risk reduction. Risk is intrinsic to nuclear deterrence doctrine as instilling uncertainty in potential adversaries is regarded as a beneficial property. Yet in a nuclear crisis situation, mistakes in estimating the inadvertent outcomes of given behaviors and interactions can lead to further escalation or actual nuclear conflict. Despite claims to the contrary by possessors, nuclear modernization is making nuclear weapons more usable by improving their operational flexibility and effectiveness in locating and reliably destroying targets. Such modernization efforts (e.g., nuclear-armed cruise missile capabilities) threaten strategic stability by creating ambiguity that increases the chance of miscalculation, misperception, escalation, and arms racing. Technological and doctrinal modernization efforts aimed at allowing for greater integration of conventional and nuclear warfare threaten long-standing taboos related to nuclear weapons testing and use. Technological advances of various kinds add new complexities and potential failure points that will strain early-warning and command and control systems, while compressing human decision-making timelines and exposing those systems to false alarms and accidents. New technologies also expand the range of actors, including nonstate actors, that might be able to exploit vulnerabilities (e.g., in cyberspace) in nuclear weapons systems, including in indirect ways such as the manipulation of policymakers’ and military strategists’ perceptions. This could have profound effects in a crisis. The idea that nuclear command and control systems can be fully air-gapped from the outside is a myth, and they contain components that are vulnerable in ways not fully understood. Given also considerable uncertainties (e.g., about the impacts of natural disasters and other phenomenon), the probabilistic risk acceptability criteria that guide national approaches to both power plants and weapons should not be taken as an actual measure of safety. Recent attention on securing highly enriched uranium and plutonium stocks and sites is laudable, but has been inconsistent and remains concentrated only on civilian nuclear material when the majority of stocks are in military hands. Independent safety oversight remains largely lacking in the domain of nuclear weapons, a special concern given its crucial importance in reducing the frequency of serious accidents across a range of hazardous technologies. New and smaller nuclear powers can exacerbate risk, as they may have less secure physical and operational control of their nuclear weapons and less doctrinal transparency and are particularly susceptible to political turmoil, governmental instability, and crisis situations. By identifying some of the most pertinent variables linked to a potential nuclear weapons detonation event, the study extends a conversation about the whole-of-the-risk equation. It points to issues on which nuclear weapons possessors and nonpossessors alike should engage with a view to reducing the risk of use of nuclear weapons. Russia’s strategic deterrence approach is grounded in its understanding of internal and external threats and its sense of asymmetry toward the West. 2 Russian military doctrine describes perceived dangers from the United States and NATO readiness to use military force, instability and terrorism that could challenge Russia’s sovereignty, and a local conflict on its vast borders that could escalate, including to the use of nuclear weapons. 3 Russian officials also have concerns about their inability to counter Western military technological developments and the dangers posed by the proliferation of weapons of mass destruction technologies to state and nonstate actors. As part of strategic deterrence, Russia developed a spectrum of nonmilitary and non-nuclear and nuclear capabilities intended for continuous employment in peacetime and wartime. 4 On one end of this spectrum are nonmilitary means that Russian leaders see as tools to achieve Russia’s national interests without the direct use of military force. Russia’s political and “information war” activities have received a lot of attention in the West as a Russian innovation. Yet, Russian military officials and analysts have argued that Russia learned this approach from observing Western activities, notably in eastern Europe and the Middle East, since the end of the Cold War. 5 Furthermore, although nonmilitary means are important to Russia’s so-called theory of victory, strategic deterrence is fundamentally a strategy based on convincing an opponent of a credible threat of using military force. As part of an effort to reduce its reliance on nuclear weapons at early stages of conflict, Russia has developed a range of non-nuclear deterrence capabilities, including conventional precision-strike systems (long-range cruise missiles and short-range ballistic missiles), air and missile defenses, and various capabilities intended to disrupt an adversary’s command, control, communications, computers, intelligence, surveillance, and reconnaissance, what the military calls C4ISR. 13 It has sought to demonstrate these capabilities in Ukraine and Syria. Russia’s direct and indirect uses of force have fueled debate about the role of deliberate escalation in its strategic deterrence approach. Such escalation could be used to gain military advantage or to get an opponent to halt its actions—an important distinction in escalation management. 14 This distinction is not something that Russian analysts address. Such tailoring has proven difficult in practice for Russia. During the Ukraine crisis, Russian leadership highlighted Russia’s nuclear status to signal that Russia’s stakes were higher than those of the West. In addition, Russian diplomats and former officials threatened nuclear use against NATO members and partners. 18 Russian aircraft “buzzed” vessels, risking accidents, and engaged in other hazardous activities. 19 Denials by officials of Russia’s support for separatists in Ukraine, as well as the July 2014 downing of Malaysia Airlines Flight 17, also raised questions about Russia’s interest or ability to credibly signal limits or engage in restraint. In the early phases of a conflict, Russian military writings suggest that Russia would first work to reduce escalation through nonmilitary means. 20 Yet, diplomacy and information activities could be viewed by the West as part and parcel of Russia’s “gray zone” strategies. On the Russian side, Western actions may be dismissed as “information war.” 21 To be sure, Russia’s restraint and bilateral diplomacy proved effective after Turkey downed its fighter-bomber in June 2015. Nevertheless, the absence of effective and credible crisis management mechanisms, including in the NATO-Russia Council, amplifies the danger that both sides will view nonmilitary means as propaganda that paves the way for military force. Russian political-military analysts have discussed the dangers of unintended escalation given the proximity of NATO and Russian military forces. 22 As conventional postures and plans are adapted to meet perceived threats, the potential for a conflict outbreak due to inadvertent or accidental escalation increases. In turn, Russia’s practical ability to manage such escalation through strategic deterrence is limited. In a nascent crisis, Russia is likely to engage in deterrence signaling and increase the readiness of selected conventional and perhaps nuclear capabilities. Russian military writings stress the importance of tight political control over and rules of engagement for military forces, especially as they signal intent to deny domains in a conflict and engage in reconnaissance. 23 Russian analysts also focus, however, on denying the opponent escalation dominance and achieving decisive effects in the initial period of war. 24 They further discuss mobilization activities, including of the public. 25 The challenge is that deterrence signaling activities may raise the risk of inadvertent escalation during a critical time, while mobilization activities could contribute to a perception that a conflict is unavoidable. As the West’s military-political deterrence posture shifts in response to Russia’s deterrence signaling and mobilization, Russia may engage in a crisis response and rush forces to the theater. Military writings point to the likelihood of active use of cyber- and electronic warfare to disrupt Western C4ISR systems. 26 These actions are likely to be reciprocated, resulting in a significant degree of damage and other consequences to both sides that are not yet fully understood. These may further stress policymakers’ abilities to understand escalation dynamics and control the employment of military forces in the theater. In addition, nuclear forces may be alerted, and warheads will begin to be moved from central storage facilities to bases. Instead of successfully halting the conflict, some Russian writings suggest that these actions may heighten concerns about the vulnerability of nonstrategic nuclear weapons. 27 Managing escalation of the conflict will depend on the mutual ability to maintain control of the use of force and understand critical thresholds. Uncertainties exist as to whether this step will be able to effectively control escalation. As some Russian commentators note, Russian doctrine does not spell out the thresholds or criteria for these strikes or how Russia will attempt to communicate what this step means. 35 Presumably, cyberattacks will also be used to disable operations of some of the intended targets, which could contribute to confusion about the aims of conventional-weapon precision strikes. More practically, strikes on counterforce targets to inflict “deterrent damage” could result in only temporary disruptions. Strikes on economic assets may solidify an opponent’s resolve. Their consequences become even less predictable in an information-war environment. As some Western analysts point out, Russia’s precision strike systems are dual capable, 36 but Russian writings do not focus on the potential of an opponent’s misperception of a Russian conventional signaling strike as a nuclear one. Presumably, Russia’s inclusion of a step with conventional precision-strike weapons could have been intended as a signal of a higher nuclear threshold. As Russia’s conventional precision-strike capabilities progress, watching doctrinal and employment evolution will be essential for understanding Russia’s critical thresholds. In the meantime, this issue could benefit from bilateral military-to-military contacts and efforts to privately clarify this new doctrinal element with Western counterparts. Russian political and military officials have expressed persistent concerns about an “aerospace attack” that could inflict damage on Russia’s strategic nuclear forces with conventional precision-strike weapons. 41 This and several related threat scenarios build on Russia’s suspicions about U.S. missile defenses, especially the capabilities of Aegis Ashore launchers that are part of the European Phased Adaptive Approach and prompt global-strike systems. 42 Russian military theorists also have concerns about inadvertent nuclear escalation that arises from the synergy of precision strike, cyber, and electronic means in combat. 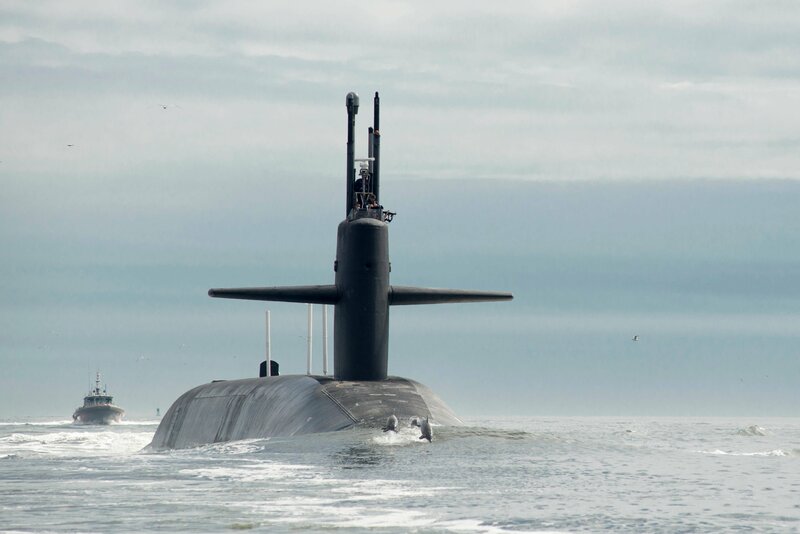 43 As the development of these capabilities continues to progress and U.S. nuclear modernization begins, it will be important to take advantage of the possibility that Russia will wish to avoid nuclear escalation and look for ways to reduce nuclear risks in a potential conflict. to encourage Russia’s exercise of restraint regarding its deliberate escalation and contribute to mitigating the dangers of unintended escalation on its part. In a nuclear crisis, effective U.S./NATO-Russian communication in an environment of cyber-, electronic, and information warfare will be key to credibly signaling limits, including the absence of a threat to the “existence of state” or nuclear forces. From this perspective, the de facto absence of a credible crisis management and communication mechanism poses a significant challenge to successful escalation management. Given the failure of the NATO-Russia Council in past crises, policy efforts need to identify or create such a mechanism. Managing the risks of accidental escalation that could result from force management errors is also essential. Western policy has allowed Russia to normalize coercive strategic deterrence activities, such as “buzzing” by military aircraft, that raise the risk of accidents involving military forces. Some in the West have advocated a plan of action on avoiding hazardous incidents in the Euro-Atlantic area. This plan provides an omnibus NATO-Russian approach to dated and piecemeal bilateral arrangements among numerous states-parties, including the 1972 Agreement on the Prevention of Incidents On and Over the High Seas and the 1989 Agreement on the Prevention of Dangerous Military Activities. 49 Such a step may help to induce Russian restraint and accountability. 1. Yu. A. Pechatnov, “Teoriya sderzhivaniya: genesis” [Deterrence theory: Beginnings], Vooruzheniye I Ekonomika, February 2016. 3. Embassy of the Russian Federation to the United Kingdom of Great Britain and Northern Ireland, “The Military Doctrine of the Russian Federation,” June 29, 2015, http://rusemb.org.uk/press/2029 (hereinafter Military Doctrine of the Russian Federation). 4. Kristin Ven Bruusgaard, “Russian Strategic Deterrence,” Survival, Vol. 58, No. 4 (August-September 2016): 7-26. 5. Timothy Thomas, “Thinking Like a Russian Officer: Basic Factors and Contemporary Thinking on the Nature of War,” Foreign Military Studies Office, April 2016, http://fmso.leavenworth.army.mil/documents/Thinking%20Like%20A%20Russian%20Officer_monograph_Thomas%20(final).pdf. 6. Andrei Kokoshin, “Ensuring Strategic Stability in the Past and Present: Theoretical and Applied Questions,” Belfer Center for Science and International Affairs, June 2011, http://www.belfercenter.org/sites/default/files/legacy/files/Ensuring%20Strategic%20Stability%20by%20A.%20Kokoshin.pdf. 7. “Alexey Arbatov: Yesli tam budet krupnaya voina, to nam budet uzhe ne do tsen na chernoye zoloto” [If there is a large-scale war, we won’t care about black gold prices], Economy Times, February 16, 2016, http://economytimes.ru/kurs-rulya/aleksey-arbatov-esli-tam-budet-krupnaya-voyna-nam-budet-uzhe-ne-do-cen-na-chernoe-zoloto. 8. Olga Oliker, “Russia’s Nuclear Doctrine: What We Know, What We Don’t, and What That Means,” Center for Strategic and International Studies (CSIS), May 2016, https://csis-prod.s3.amazonaws.com/s3fs-public/publication/160504_Oliker_RussiasNuclearDoctrine_Web.pdf. 9. Vladimir Kozin, “Russian Approach to Non-Strategic Nuclear Weapons and Confidence Building Prospects,” n.d. (remarks at workshop in Warsaw held February 7-8, 2013). 10. Gudrun Persson, ed., “Russian Military Capability in a Ten-Year Perspective - 2016,” FOI-R--4326--SE, December 2016, https://www.foi.se/report-search/pdf?fileName=D%3A%5CReportSearch%5CFiles%5C5fa9f89b-8136-4b15-9aaf-1d227aee90a0.pdf. 11. Alexander Golts and Michael Kofman, “Russia’s Military: Assessment, Strategy, and Threat,” Center for Global Interests, June 2016, http://globalinterests.org/wp-content/uploads/2016/06/Russias-Military-Center-on-Global-Interests-2016.pdf. 12. Anton Lavrov, “Russia’s Geopolitical Fears,” Moscow Defense Brief, No. 5 (May 2016). 13. V.M. Burenok and O.B Achasov, “Neyadernoye sderzhivaniye” [Non-nuclear deterrence], Voyennaya Mysl, December 2007. 14. Forrest Morgan et al., “Confronting Emergent Nuclear-Armed Regional Adversaries,” RAND Corp., 2015, http://www.rand.org/content/dam/rand/pubs/research_reports/RR900/RR974/RAND_RR974.pdf. 15. For a discussion of Russia’s defensive logic, see Andrei Kolesnikov, “Do The Russians Want War?” Carnegie Moscow Center, June 2016, http://carnegieendowment.org/files/Article_Kolesnikov_2016_Eng-2.pdf. 17. A.A. Kokoshin, Yu. N. Balueyvskiy, V. Ya. Potapov, “Vliyaniye noveishikh tendentsii v razvitii tekhnologii i sredstv vooruzhennoi bor’by na voyennoye iskusstvo” [Impact of new tendencies in development of technologies and means of arms combat on military art], Vestnik Moskovskogo Universiteta, Vol. 25, No. 4 (2015). 19. Łukasz Kulesa, Thomas Frear, and Denitsa Raynova, “Managing Hazardous Incidents in the Euro-Atlantic Area: A New Plan of Action,” European Leadership Network Policy Brief, November 2016, http://www.europeanleadershipnetwork.org/medialibrary/2016/11/02/ab4a4c1d/ELN%20Managing%20Hazardous%20Incidents%20November%202016.pdf. 21. S.G. Chekinov and S.A. Bogdanov, “Evoliutsiya sushnosti I soderzhaniya ponyatiya ‘voina’ v XXI stoletii” [Evolution of the nature and meaning of the concept “war” in the 21st century], Voyennaya Mysl, January 2017. 22. See “Velichaishaya ostorozhnost i blagorazumiye” [Greatest care and consideration], August 24, 2015, http://www.globalaffairs.ru/number/Velichaishaya-ostorozhnost-i-blagorazumie-17638. 25. See S.V. Goncharov and N.F. Artamonov, “Moralno-psikhologicheskoye obespecheniye mobilizatsionnoi raboty” [Moral-psychological support of mobilization work] Voyennaya Mysl, April 2014. 28. A.A. Kokoshin, “Strategic Nuclear and Nonnuclear Deterrence: Modern Priorities,” Science and Society, Vol. 84, No. 3 (2014): 195-205. 29. Yu. A. Pechatnov, “Metodicheskii podhod k opredelniuy sderzhivayushchego ushcherba s uchetom subyektivnykh osobennostei ego vospriyatiya veroyatnym protivnikom” [Methodological approach to determining deterrent damage considering subjective specialties of its perception by likely adversary], Vooruzheniye I Ekonomika, Vol. 3, No. 15 (2011). 30. Military Doctrine of the Russian Federation, no. 26. 34. Military Doctrine of the Russian Federation, no. 14b. 35. Konstantin Sivkov, “Pravo na udar” [Right to strike], Voyenno-Promyshlennyi Kuryer, March 5, 2015, http://vpk-news.ru/articles/19370. 36. Pavel Podvig and Javier Serrat, “Lock Them Up: Zero-Deployed Non-Strategic Nuclear Weapons in Europe,” UN Institute for Disarmament Research, 2017, http://www.unidir.org/files/publications/pdfs/lock-them-up-zero-deployed-non-strategic-nuclear-weapons-in-europe-en-675.pdf. 37. Andrei Zagorski, “Russia’s Tactical Nuclear Weapons: Posture, Politics, and Arms Control,” Institute for Peace Research and Security Policy, 2011, http://www.unidir.org/files/medias/pdfs/executive-summary-a-zagorski-eng-0-325.pdf. 38. Dave Johnson, “Nuclear Weapons in Russia’s Approach to Conflict,” Fondation Pour la Recherche Stratégique, No. 06/2016 (November 2016), https://www.frstrategie.org/publications/recherches-documents/web/documents/2016/201606.pdf. 41. Alexey Arbatov, “Understanding the U.S.-Russia Nuclear Schism,” Survival, Vol. 59, No. 2 (April-May 2017). 42. Vladimir Dvorkin, “Yadernyi psikhoz krepchayet” [Nuclear psychosis is getting stronger], Nezavisimoye Voyennoye Obozreniye, May 19, 2016; Greg Thielmann and Andrei Zagorski, “INF Treaty Compliance: A Challenge and an Opportunity,” Deep Cuts Working Paper, No. 9 (February 2017), http://www.deepcuts.org/images/PDF/DeepCuts_WP9_ThielmannZagorski.pdf. 44. Lisa Sawyer Samp et al., “Recalibrating U.S. Strategy Toward Russia,” CSIS, March 2017, https://csis-prod.s3.amazonaws.com/s3fs-public/publication/170329_Hicks_USStrategyTowardRussia_Web.pdf. 45. Dennis M. Gormley, “The Offense-Defense Problem,” Deep Cuts Working Paper, No. 6 (May 2016), http://deepcuts.org/images/PDF/DeepCuts_WP6_Gormley_UK.pdf. 47. Sergei Oznobishchev, “Russia and NATO: From the Ukrainian Crisis to the Renewed Interaction,” in Russia: Arms Control, Disarmament, and International Security, ed. Alexei Arbatov and Sergei Oznobishchev (Moscow: IMEMO, 2016), https://www.sipri.org/sites/default/files/SIPRI-Yearbook-Supplement-2015.pdf. 48. For a good discussion of some of these approaches, see Kimberly Marten, “Reducing Tensions Between NATO and Russia,” Council Special Report No. 79, Council on Foreign Relations, March 2017, https://www.cfr.org/sites/default/files/pdf/2017/03/CSR_79_Marten_RussiaNATO.pdf. 52. President of Russia, “Meeting of the Valdai International Discussion Club,” video, October 27, 2016, http://en.kremlin.ru/events/president/news/53151. 53. The author would like to thank Lynn Davis and several other reviewers for their feedback on earlier versions of this piece. Anya Loukianova Fink is a Stanton Nuclear Security Fellow at the RAND Corporation. The views expressed in this article are those of the author and do not necessarily reflect the positions or policies of the Stanton Foundation or the RAND Corporation. The Trump administration’s re­cently completed North Korea policy review calls for “maximum pressure” on Pyongyang, but leaves open room for engagement. Although President Donald Trump warned in an interview in late April that “a major, major conflict” with the North was possible, he also said he would prefer a diplomatic outcome. Following “Track 2” talks in Oslo in May, a senior North Korean diplomat, Choe Son Hui, told reporters that his country is open to dialogue with the United States “under the right conditions.” The task at hand is to find out what the right conditions might be. In thinking through a diplomatic path, it is worth considering some lessons from the Iran nuclear negotiations. Of course, the two cases are very different. One obvious difference is that North Korea has nuclear weapons; Iran has never possessed a nuclear weapon and is a member of the nuclear Nonproliferation Treaty. It is clear that the applicability of the Iran deal, known as the Joint Comprehensive Plan of Action (JCPOA), as a model is limited at best, but the process of diplomacy that the United States pursued with Iran could offer some insights on how to begin engagement with an adversary whose leadership is extremely distrustful of the United States and vice versa. There are three elements of diplomacy with Iran that we should be looking at. The first is to initiate a low-key diplomatic channel authorized at the highest level. Prior to the start of official negotiations, diplomats from the United States and Iran engaged in a series of meetings held secretly over a period of about 16 months. These eventually led to the multilateral P5+1 talks and an interim agreement in November 2013. Given the level of mistrust between Pyongyang and Washington, it would be a good first step to try to have a dialogue without preconditions. We can call it “talks about talks” to help clarify the acceptable conditions to begin negotiations. How can we meet them and overcome differences? What are the non-negotiables? The second element is to focus on a limited set of realistic objectives, not a grand bargain. The U.S.-Iranian discussions were limited to what both sides deemed to be a very specific, manageable set of items in the nuclear field. The United States placed a priority on preventing Iran from obtaining a nuclear weapon; the Iranians focused on lifting sanctions. Now the United States must decide on its highest priority with North Korea. It must zero in on identifying a key, early goal that is within the realm of achievability. To diffuse tensions, the best bet would be to begin by pursuing a freeze on North Korea’s nuclear testing. One of the key goals would be to get International Atomic Energy Agency inspectors back into the country. One of the most remarkable elements of the JCPOA is its extensive monitoring and verification requirements. It is an important precedent we should strive to emulate. A suspension of testing is an interim step, and a nuclear weapons-free Korean peninsula should remain an end goal. Writing recently in The New York Times, Harvard scholar Graham Allison asked rhetorically, “Is United States’ national security really strengthened if a 33-year-old dictator with a record of executing his enemies and defying red lines is left with an arsenal of 20 warheads and missiles that can deliver nuclear strikes against Seoul and Tokyo?” We know the answer. The suspension of testing is an important first step that could create the space to pursue an additional agreement or agreements. The third element is to pursue a win-win approach. The United States and Iran committed themselves to a win-win narrative in their early talks that enabled them each to say they succeeded in fulfilling their objectives at the end. This reinforced the understanding that each side would have to make compromises. Recently, I was on a panel, and one of the other participants disagreed with what I was proposing. The reason, he said, was that we have tried diplomacy with the North Koreans before—it is too difficult, they cheat, and they cannot be trusted. I heard the same arguments about Iran for years. In fact, during the 35 years of hostility before the JCPOA was reached, there were countless failed attempts at diplomacy, as well as missed opportunities. Yet, we now have an agreement that is working. Because we have failed in the past does not mean we should not try again. Indeed, we should learn from past attempts. Suzanne DiMaggio is a director and senior fellow at New America, where she directs a long-running U.S.-Iran policy dialogue and a recently launched a U.S.-North Korea “Track 2” dialogue. This piece is adapted from remarks at the Arms Control Association’s annual meeting on June 2.